#2very nicely decorated, with bathtub/shower fix, bidet and window on inner courtyard. with table and 4 chairs, bench, potted plants. Independent heating, fans, washing machine, tv, vcr, dvd player, wireless Internet connection, stereo, a/c, no phone, no elevator, terrace. Monthly possible. Best location for exploring historic Rome and for shopping, too! space with a dumb waiter to move all you food, wine etc up. Small but very adequate kitchen. Back bedroom very quiet. Campo De Fiori does not seem as touristy as most of the other squares and is right next to the Pantheon. You could spend a month in just these two areas feeling like a local and not ever eat at the same resturant twice. Thankful for the month we spent in Rome. While the location of apartment is amazing (5-10 minute walk to pretty much anything), the apartment itself is not in good shape. I understand that it is old building, and some issue are easily attributed to having old plumbing, wiring, infrastructure - but many issues are not related to building age and just point to lack of maintenance. - key holder arranged for broken terrace chairs to be replaced immediately upon entry, but the terrace too dusty to use, and umbrella with no stand was the only shade. Sadly, even with amazing location and charming rustic feel to it, I can't recommend this apartment to anyone. It is by far the dirtiest apartment we have rented online, and the only true disappointment of all apartments rented in last 6 years. 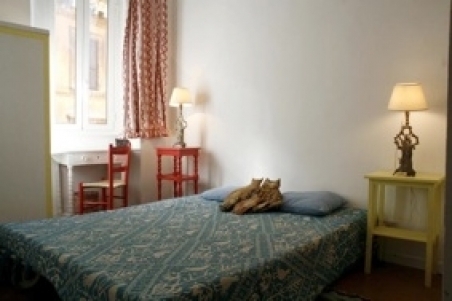 Lovely apartment in a great spot for all the best things to see in Rome! Comfortable beds and good outdoor space for relaxing and eating. Only hiccup is that at night the little square below the apartment seems to fill with young people drinking and being very very noisy until 3 or 4 am. This is fine if you sleep in the two back bedrooms, but if you are in the front bedroom or sitting room (on sofa bed) be prepared...but, if you are also the partying type, it will make no difference to you. The agents are friendly, helpful and very efficient. This is the second time we have used Roman Reference, and we will be back! We truly enjoyed our stay in the apartment. Spacious, well equipped, decorated in an arty and fun way - the grandchildren just loved the blue bathroom! We LOVED the location - in the middle of every Roman attraction, just a minute away from the gorgeous market at Campo dei Fiori and lots of good restaurants and walking distance to many sights. Loved the top terrace where we had our breakfast and where we relaxed after a long day of sightseeing. Indeed, we'll love to come back anytime! A very nice apartment; there was a minor glitch at arrival time, the previous renters had not yet left and we had to wait several hours to be let in (after being awake all night in a cramped airplane seat!) but Maria, the person who was to let us in, was very helpful and apologetic. Also, were charged additonal Euro 25 for extra sheets (They had put my daughter and me in the same bed!!). But a well equipped apartment (could use a few dinner plates and better instructions about using the TV), in a very good location. These problems were very minor and I would certainly rent this apartment again and recommend it to others. Perfect location in Rome. Nice terace with food elevator. Perfect with two bathrooms. Lot of space! Good apartment. Vi vil gerne anbefale Roman Reference. Hurtig og pålidelig mailkorrespondance på engelsk. Ingen problemer med betaling eller andet og god, løbende opfølgning. Det bedste ved lejlighed 335 er den helt unikke og perfekte beliggenhed!! Kun aircondition i de to soveværelser - hvis flere overnattende end 4 derfor meget varmt om sommeren (trods elektrisk vifte) i øvrige rum/sovepladser. Tagterrasse fin om morgenen og aftenen. Vi savnede dog en solparasol eller markise og ordentlige stole på terrasse. Vi havde en dejlig ferie i Rom. The apartment was clean, spacious and centrally located. The terrace became a quiet retreat after a busy day or evening. There was some street noise at night but that was to be expected since the apartment was very near Campo dei Fiori. The apartment's owner went out of her way to accommodate us. She even purchased a coffee maker prior to our arrival. The key holder was at the apartment when we arrived on Sunday, May 20. She also arranged transportation to the airport for us on Monday, May 28. The other couple had an early morning departure and the driver was in the courtyard right at 4:30AM. The only suggestion I would make is to have written instructions for using the washing machine in the primary language of the guests. We felt at home and enjoyed our stay. Prima appartement. Goed te doen met 6 personen Geweldige ligging in het centrum van Rome. Echt een aanrader ! Wonderful location. Fourth floor location requires climbing stairs, but the rooftop terrace is the reward! We stayed in #335 Largo dei Librari on our recent trip to Rome. We booked it through Roman Reference, who were very easy to work with - their communication by email was excellent. We were met at the apartment by the key holder who was very friendly and spoke some English. She showed us how everything worked and gave us clear instructions, and pointed us in the right direction for groceries and the tourist information office. The apartment is on the top floor of a three-story walk-up. There is no elevator so we can’t recommend it for people with mobility issues. The rooms were clean, bright, and nicely decorated by the owner. The beds are very comfortable and linens were clean. There were plenty of blankets and towels. There are two bathrooms, both nicely appointed, although the showers are hand-held and the showerheads could use replacing. We used the washing machine (no detergent was provided but we found some at the local grocery) Italian homes generally have no dryers, so we hung our wash on the clothes drying rack in the bathroom. We had good WiFi internet although it occasionally went down for a short while. The kitchen is fully stocked with cooking utensils, a coffee pot (both American and Italian style). No microwave was provided, but a fully functioning stove served us perfectly. TV service worked well, although it was all Italian programming, which made for an interesting cultural experience. There is a tiny patio off the back with some interesting Roman artifacts (this apartment is built on the ruins of Teatro di Pompey, where Caesar was killed!) There is a small terrace which can be reached by a spiral staircase, which has a nice view of the dome of one of the nearby churches. The piazza Largo dei Librari is lively despite is tiny size. There was some noise from the street, but that was to be expected. The tiny church next door is charming. There is a gelato shop steps from our door, a small snack bar and tobacconist shop and a fantastic fried fish place, the renowned “Filetti di Baccala”, which was packed with both locals and tourists - the staff was friendly and and the fried fish filets and chicory salad were fantastic! The apartment has a great central location on a nice pedestrian street, via Giubbonnari, with lots of nice shops selling jewelry and apparel. A block away is Campo d’Fiori, with its wonderful produce market. Shops and restaurants line the square, and there is activity there day and night. From the apartment you can easily walk to Trastevere, the Pantheon, Piazza Navona, and a longer walk will take you to the Vatican and the sites of ancient Rome, the Colosseum and Forum. There are bus stops nearby. We have just returned from the Largo Dei Librari appartment. Everything was wonderful, even the hairdresser next door! Thank you for your help in arranging our holiday. We were three adults staying in this great appartment for four days - three nights. The location could not be better, as it is situated in the old central part of the city. The lady who gave us the keys were delayed, but it did not matter to us as we killed the waiting at the beautiful Largo dei Librari just outside the front door. The other lady that came to collect the keys at check-out did not speak english. Very nice and smiling, and she let us stay for another four hours since there probably was'nt new guests to check-in. The appartment is large! 140 kvm. Could easy fit up to three couples. The decor is charming and there's a stereo, cd's and hundreds of books (mostly italian, a few english) and a tv-set. The terrace was a big plus. Nice for breakfast or a cold beer in the evening. The small piazza, Largo dei Librari, nearby get's a bit noisy at night, but it was'nt really a problem to us. Internet is good, but does not reach out to every corner of the place. Shopping is superb and just outside the door. The market palce, Campo dei Fiori, is nice and very busy. Come in the morning. Use the car service mentioned is the appartment welcome letter. Maurizio is a fine driver and a bit cheaper than taxis. I would love to recommend this to anybody who need a good place to stay in Rome. perfect. bathrooms are different than we used to in United Stated, but they probably similar everywhere else in Rome. Very big appartment with a nice terrace. Excellent location. Some noise from the street in one of the bedrooms. It was just too cute! Nice location overlooking a quaint little piazza. The Apartment itself was huge. We rented it for two couples and had and had plenty of room for entertaining. It is decorated very fun and colorful, with an Italian flair. We really enjoyed the roof top deck even though we were limited in its use because of the weather. It actually snowed for the first time in 24 years while we were there! Charming owner speaks no English so come prepared. Wir waren schon zum zweiten Mal in dieser Wohnung. Die Lage, die Dachterrasse, das Aquarium-Bad sind toll, aber die LÃ¤rmkulisse vom Largo de Librari leider z..T. erheblich. Daher nur eine "gut" als Bewertung und kein "ausgezeichn et". Dejlig beliggende rummelig lejlighed. Fin tagterrasse. Gode toilet og badeforhold. Kan let huse 2- 3 par. Beautiful, very large apartment in a great location..within walking distance to all major attractions. Minor faults such A/C only in bedrooms and TV only gets one channel can be overlooked by the size and location of this apartment. As a side note, while we were there the washing machine broke and Roman Reference was wonderful and fast in helping me...they located the owner and she had a handyman over the same day to try to fix it. I would stay here again and I would recommend this apartment, but more importantly I would recommend using Roman Reference as they were quite helpful and available on all matters. Very roomy and an excellent location. sur les toits ou il fait si bon prendre son petit dÃ©jeuner avant d'aller faire le marchÃ© Ã Campo Dei Fiori. This spacious and well appointed apartment was a joy for our family of 6 to come home to after a long and hot day sightseeing. It was a wonderfully central location near stores, restaurants and sights. I have no hesitation recommending this apartment. Great location, worked fine for our purposes. The little piazza was very noisy in the evening, (although not unusual for Rome), nice terrace, good layout, amusing decor, great book collection. Could have used a third set of keys as we were six people. Light in dressing room didn't work. TV didn't work well. A few touches would have made it much better. e.g. a list of suggestions such as where to buy such necessities as extra toilet paper--we never came across a market nearby and luckily managed with the few rolls supplied. Also whom to call about the broken light--the lady who supplied the key spoke no English so I didn't call her. Altogether satisfactory though. Will recommend your site and service. Thank you! La fachada necesita una reforma. Pero por el resto, la ubicaciÃ³n es perfecta, el apartamento es gigante. Se puede ir andando a cualquier lado. La chica que nos atendiÃ³ fue muy amable, no se limitÃ³ al apartamento sino que ademÃ¡s nos dio alguna informaciones Ãºtiles para nuestra visita a la ciudad. Bellissimo apartamento e bell posto ... tutto sara ideale. Mille grazie, tutto era perfetto!